After a year of anticipation, of false starts and promises he'd see a vehicle in Richmond "soon! ", Ronny's day has arrived. 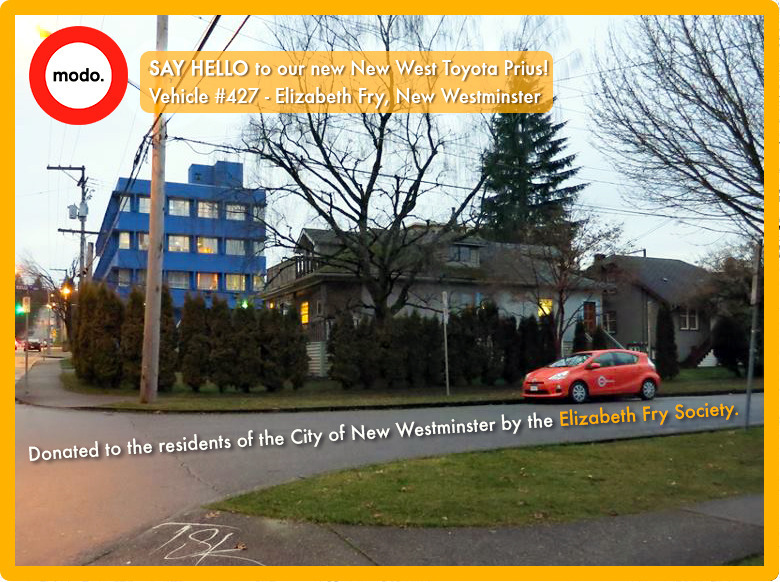 Find Vehicle #413, a bright orange 2012 Toyota Prius C hatchback about a block and a half east of Brighouse Skytrain Station, on the Canada Line. Great news for local residents as well as members looking to mode-share, taking the Skytrain from points north, in order to save on costs and emissions. Now... who's up for a poke around Finn Slough? I have been member since 2002. I just moved to Richmond June 2012. Why did you become a member? What prompted you to sign up? I like the flexibility of having access to and use of a car when I need one without the commitment and expense of owning one full time. I was prompted by a need for more mobility than transit provides. Which vehicle were you using before the new Richmond vehicle arrived? How did you get to that vehicle? I usually used vehicles in Yaletown. Since I moved to Richmond I accessed by way of Canada Line or a walk from my downtown Vancouver work. Which is your favourite Modo vehicle? I really love the Mazda vans for longer excursions or the Fiat 500 for fun. Where do you usually Modo? What are some of your more typical trips? Greater Vancouver area and the Fraser Valley. My trips are typically to go to big box stores, farmer's markets, farms and friends. What has been the most memorable Modo experience you've had? Driving to and back from the Okanagan with my father and partner. The vans are amazing for road trips. Have any upcoming adventures planned? Really excited about getting to the upcoming farmer's markets and enjoying BC's awesome bounty of fresh local produce. Modo is excited to announce the expansion of our fleet and resident/permit parking exemptions for Modo vehicles in North Vancouver! 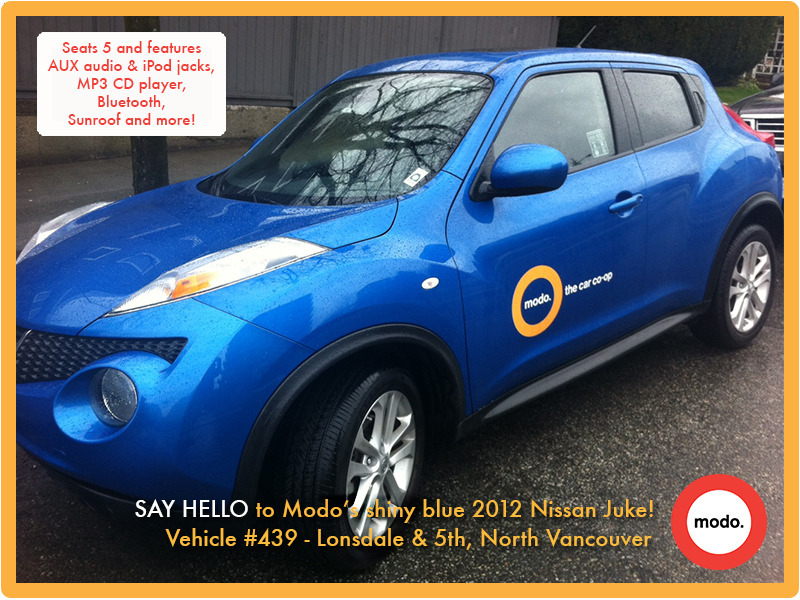 Last week, we replaced our vehicle at Lonsdale and 5th with a shiny blue 2012 Nissan Juke, which seats five and offers not only a comfortable ride but also AUX and USB jacks, MP3 CD player, Bluetooth and… a sunroof! This week, we also added a brand new smoky brown 2013 Nissan Cube up the hill from the Juke, at Lonsdale and 21st (a.k.a. "School Board"). As well, thanks to the City of North Vancouver, Modo vehicles based in North Van may now park in any Residential or Permit Only parking spots. For those who don't live on the North Shore, mode-sharing is a great last-mile option, as our North Van vehicles are accessible via transit. Good news for those looking to get out of the hustle of the city and find sanctuary on the slopes of Grouse, a leisurely walk through Lynn Canyon or a cruise up to Squamish! Thanks to the generous donation by the Elizabeth Fry Society, Modo members in New Westminster now have one more option for scooting around town. Located in its designated stall on the west side of Kelly St, just north of the hospital on Sherbrooke St, the bright orange 2012 Toyota Prius C is a hybrid-electric 4-door hatchback. The Elizabeth Fry Society is a community-based non-profit dedicated to supporting at-risk and marginalized women and children caught in the criminal justice system, with chapters all across Canada. The New West facility offers rehabilitation, counselling and support services that help empower women to find housing and reintegrate as healthy, contributing members of their communities. LOCObc, Vancity and The Tyee are offering a fun opportunity to win awesome prizes while showing your love for locally owned businesses. All you have to do is Pen a Love Letter to Your Favourite Local Biz and be entered to win a Tofino escape, free $$, carsharing credits, a cooking class, designer threads and more! A great opportunity to give thanks, raise awareness and celebrate BC’s many excellent locally owned businesses. 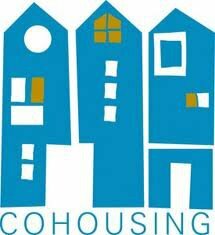 Two opportunities to join Vancouver Cohousing in making history by supporting Vancouver’s first cohousing project: Attend the public hearing at City Hall (March 12 at 6 pm) and sign the online letter (www.vancouvercohousing.com/support). Want to learn more? Follow their story via Facebook, and send a message via the website for more information or to participate further. When a member expressed concern about regularly entering a darkened van, suggesting it be mandatory to leave the dome light set to 'auto' before fobbing out, we asked other members via Twitter what they thought. Find their responses here. What do you think? 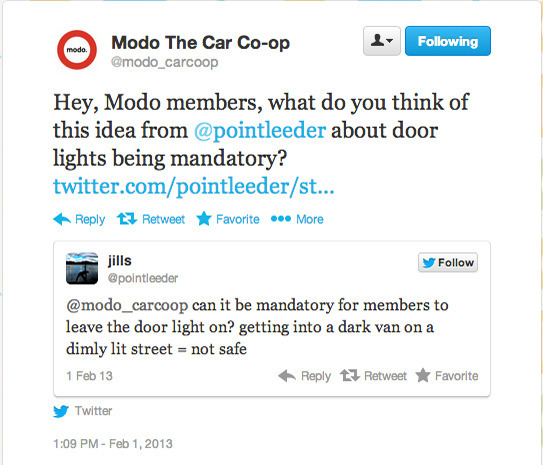 Send your thoughts and ideas via Twitter (@modo_carcoop) or email (info@modo.coop; subject "Feedback re dome light"). 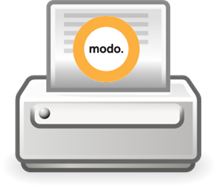 All Modo members can download any of their own invoices, anytime. If you're currently receiving your Modo invoices via paper mail and would like to switch to electronic delivery, click here for detailed instructions. Vancity is offering Modo members a head start on its Homebuyer’s Bundle (which launches for non-Modo members March 1), with special rates, savings in legal/appraisal fees up to $1,500 and more. "In addition, Modo members will receive a $100 gift card to one of our community partners," says Ryan McKinley, Vancity's mortgage development manager. 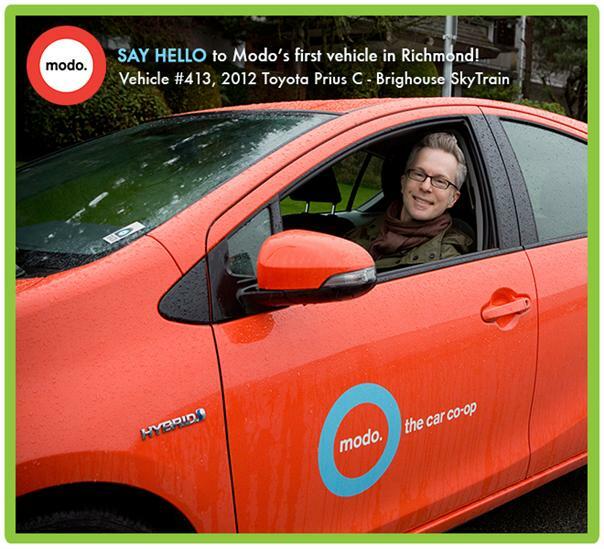 As Modo is one of Vancity's community partners, the gift card may go toward $100 free carsharing. "As a member of Vancity they will also receive a portion of their interest back each year through our Shared Success program." Call or email Ryan for details at 604-340-1611 or ryan_mckinley@vancity.com. 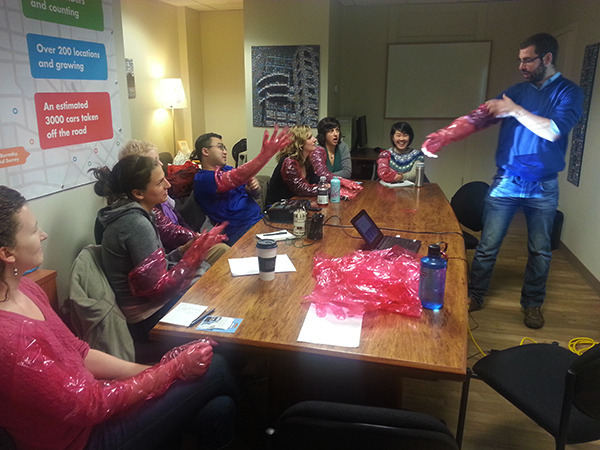 Modo is a proud venue sponsor for Trade School Vancouver, a non-traditional learning community that runs on barter. Participants pay for classes with items and services, not money. How novel! Classes come in all shapes and sizes and the subjects range from Life Drawing to What is Milk and Where Does it Come From? (the latter pictured above). "We so appreciate our partnership with Modo and their willingness to allow us to host classes in their Community Room," said Alexxa, part of the local team of organizers. "The support of Modo is a big reason for our early success." Check out some of the upcoming classes Alexxa is looking forward to in Modo's Community Calendar, below. PechaKucha is a popular speaker series that takes place around the world with creative people sharing ideas, works, thoughts, etc in 20 slides set at 20 seconds each. The local chapter, for its 26th show, is partnering with Women Transforming Cities to present a special edition on the theme of designing an ideal city for women and girls. Speaker details and tickets. Modo is proud to be a continuing sponsor of Vancouver Farmer’s Markets. At the market this month: apples, artichokes, arugula, beans, beets, Brussels sprouts, cabbage, chard, carrots, chicory, collard greens, daikon radish, eggplant, garlic, hazelnuts, honey, kale, leeks, lettuce, mushrooms, parsnips, pears, peppers, sunchokes, turnips, winter squash, eggs, milk, cheese, beef, chicken, lamb, halibut, pork, sablefish, salmon, shrimp, cod, tuna, and more. No home composter? Bring food scraps for drop off! Details. Join Modo at this free open house event for Surrey's new downtown. Speakers include Gordon Price, director of SFU's City Program, who'll speak on Surrey's urban renewal; Aubrey Kelly of the Surrey City Development Corporation, offering a glimpse at what’s coming to Surrey’s new downtown; Don Luymes from the City of Surrey, speaking on rapid transit planning and Surrey’s City Centre Plan; and Michael McDonald of Kasian Architecture offering an Introduction to Surrey’s New City Hall. Plus a Lego building challenge for families! Details. Now in its third year, Ubizo (oo-bee-zoh) is a day-long workshop and business development think-tank designed for locally owned, values-based business owners and leading-edge social entrepreneurs. This one-of-a-kind event brings entrepreneurs, mentors and peers together to discuss common business challenges and to create new strategies for business growth and success. Details and tickets. LOCO BC events are hosted by members in factories, stores and warehouses, with good local food, drink and business connections with the city's most innovative entrepreneurs. Get to know other members, strengthen community and leverage the LOCO network to support a stronger local economy. The March event takes place at the 8 1/2 Restaurant. Register. Group and panel discussion with Bill Reese, Tom Walker and David Rosnick, who recently authored the research paper, "Reduced Work Hours as a Means of Slowing Climate Change," which is getting a lot of media attention. Reserve your spot at the Wise Hall event. Details. Restaurants from Whistler to White Rock and across the Fraser Valley are contributing 25% of all food sales on March 7 to people living with HIV/AIDS as part of Dining Out For Life. Over the last 18+ years, BC’s largest restaurant fundraiser has raised more than $3 million for HIV/AIDS support services through A Loving Spoonful and Friends For Life. New this year: Receive 20% off every Tuesday, from March 12, 2013, through February 25, 2014, at participating restaurants through Vancity. Learn more. Whether you are a first time backpacker or a budding flashpacker, this workshop will cover essential travel tips from A to Z. (Yes, that includes Q, X and Z!) Discover the pros and cons of different backpacks, tricks for stashing your cash and some simple ideas on what and how to pack. By the end of this course, you will take away practical advice, a resource list and, the best part, inspiration for your first or next journey. Register. After this workshop, participants will leave with the confidence to use the VTL's ski and snowboard waxing/tuning tool set at their own home. The workshop will focus mainly on downhill skis and snowboards; most of the information being taught will be transferable to cross-country skis. Facilitator Sean Hillis will go through basic waxing and edge tuning/maintenance techniques, then your new skills will be put to work through lots of practice! Register. Sick of seeing those sturdy baling straps go to waste? This is a workshop on how to repurpose them into baskets and more! See illustrations and examples. Register. Trying to decide what career path to take, or means of getting there? Career Planning 101 will examine the decision making process in choosing your career goals, managing decisions, and giving yourself the best shot at success. This is not a Resume focused class. It’s a You focused class and will be discussion driven. Recommended resources will be covered. Register. The Vancouver Tool Library is excited to announce this interactive, multi-day placemaking event scheduled for July 2013. Inspired by Portland's annual Village Building Convergence, VTL plans to collaboratively transform 10 underutilized private and public spaces in Vancouver into common places that foster neighbourliness. By day, participants will collaborate on placemaking projects such as street murals, building community furniture and educational/play areas, or neighbourhood sharing stations; in the evening, participants will continue to gather for workshops, music and theatrical performances that celebrate our communities. What happens during City Commons is up for discussion at this information session, at the Mt. Pleasant Community Centre. Bring your creative ideas and meet other people who may be interested in collaborating on a project. RSVP. Earth Hour is the single, largest, symbolic mass participation event in the world. Born out of a hope that we could mobilize people to take action on climate change, Earth Hour now inspires a global community of millions of people in 7,001 cities and towns across 152 countries and territories to switch lights off for one hour, from 8:30-9:30 pm, as a massive show of concern for the environment. Details. Featuring a 2013 brown Nissan Cube (#437). A 2012 blue Nissan Juke (#439) replaced the 2003 Protege5. Featuring a 2008 white Toyota Sienna (#223). Featuring a 2012 orange Toyota Prius C (#427). 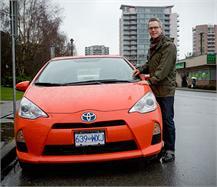 Featuring a 2012 orange Toyota Prius C (#413). A 2012 blue Toyota Matrix (#432) replaced the 2005 Echo. UPDATE: UBC Keenleyside/Pathways is no longer available. The closest cars are at UBC Wesbrook Discovery Centre and UBC Hampton Place. A truck (2007 white Mazda B3000, #171) replaced the car. A 2010 orange Toyota Matrix (#307) replaced the 2007 Mazda 5. A truck (2004 Ford Ranger, #241) replaced a car. UPDATE: W 8th & Bayswater is no longer available. Featuring a 2012 white Honda Civic (#406). Features a 2013 silver Toyota Prius Plugin (#419), the first of its kind in BC - and a minor upgrade from the 2011 Nissan LEAF. A 2013 grey Nissan Versa sedan (#438) replaced the 2007 Sonata. Our minivan was chopped in half by a snowplough (yes, really), so we replaced it with the only minivan available, a 2007 Mazda 5 (#163). A 2011 Nissan LEAF (#328) — an all-electric vehicle — replaced the 2008 RAV4. The car is now parked at the electric charging station, instead of its old stall. A car (2007 orange Toyota Yaris hatch, #271) replaced the truck. A 2012 red Nissan Versa hatch (#430) replaced the 2007 Mazda 5. A truck (2008 Ford Ranger, #361) replaced a car. The Mazda 2 is still there. A car (2007 silver Toyota Yaris sedan, #225) replaced the truck. The Prius, Yaris hatch, Matrix, Juke, and Grand Caravan are still there. Note: There are no floater vehicles located at the Main Street Skytrain Station location.